We have so many reasons to love Los Feliz in Los Angeles: the authentic food, the awesome nightlife, and the diverse community. But if you’ve got a shopping bug or love hunting for unique pieces, you have to check out the shopping in Los Feliz. Tired of shopping at chain stores and coming home with the same stuff? Hop over to Los Feliz and shop at some of these local small businesses. You’ll find vintage items and one-of-a-kind handmade crafts at the boutiques and local shops in this historic Los Angeles neighborhood. Why go to a chain bookstore when you can visit a hip Independent bookstore that’s been around since the 90’s? 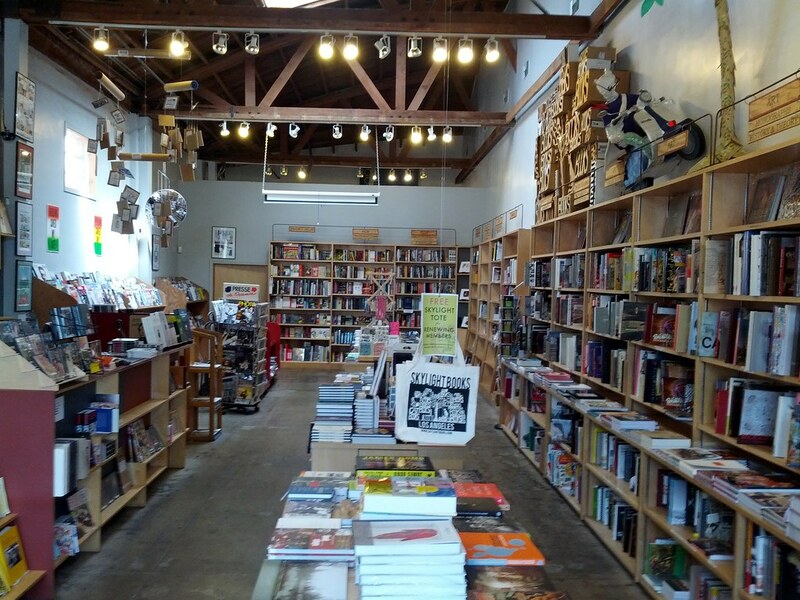 Skylight Books near Griffith Park offers a wide range of books for its varied audience and readers in the Los Angeles area. The store carries everything from graphic novels and magazines to children’s books. If you aren’t sure what you should read next, try checking out the curated staff picks (they’re posted online if you’d like to read them). And if you are looking for more than just shopping, independent bookstores run community events. Skylight Books hosts the Coyotes Book Club every month and features regular events with authors. Don’t buy a generic gift this Christmas season. Go to a shop like Spitfire Girl where you’ll find special, hand-crafted items for friends, family, and loved ones. The founder of Spitfire Girl, Kristin, shared her inspiration in an interview with Modcloth (read here). She described how the experience of hand-making invitations for her own parties and her daughter’s birthday party gave her the idea to open a store. Kristin and other artists (like her husband and daughter) design products sold in her store, like postcards printed on pieces of wood. You can’t find these just anywhere! She carries box cards, candles, perfumes, gift sets, dolls, bath salts, lotion, and more. For the home, you’ll also find pillows, tea towels, handmade soaps, etc. You might find something you didn’t know you wanted or needed! For those of us with a passion for buying clothes and regularly updating your closet, Squaresville is heaven on earth. This second-hand clothing store has been operating in Los Feliz since 1996, making it more than twenty-years-old! Squaresville buys, trades, and sells vintage, second-hand, and designer clothing. Specifically, this store collects pieces from the early 1990s all the way to the 90s and keeps recent styles in stock for its customers. Regulars will love shopping here, because the stock is always rotating. You’ll never know what you’ll find from one day to the next. Your shopping experience is always new. Love antiquing and vintage finds? Are you always checking out the inventory at your local Good Will and antique stores? Then you have to stop by Co-Op 28, voted Best of LA Boutique Store in 2015. Located in Los Feliz Village, this alternative store carries everything from furniture, clothing, signs, books, jewelry, artwork, home goods, candles, and more. When you shop at Co-Op 28, you know that you are supporting local business as well as local artists. The store carries objects, both vintage and handmade, from more than one-hundred artists. If you haven’t been there to shop in a while, then you might not know about the store’s new furniture collection, titled the Los Feliz Collection. You can order custom options or you can order a pre-designed couch produced by a local manufacturer. Our favorite part of the store is the counter made of stacked books and shelves. Co-Op 28 will also be launching an online store on its website, where they are also announcing the opening of the Bukowski’s Intellectual’s Dive Bar behind the store. Soon, you may want to hang out where you shop. If you are passionate about fashion that is both functional and beautiful, then you will love the designer Carol Young. After her fellowship at Cornell University, she designed her own line of clothing that is recycled, organic, and designed for people living active lives. At her store, you’ll find dresses, tops, bottoms, shoes, boots, throw pillows, travel wear, and more. She also carries other brands in addition to her own. Wacko Soap Plant may be one of the weirdest shops you’ve ever been in. With a history dating back to 1971, Wacko Soap Plant is a well-known name in Los Angeles. At its current location, the store spans 6,000 square feet and is stocked full with popular culture items, music, books, toys, candy, gadgets, posters, clothing and more. The store originally offered handmade soaps, ceramics, and leatherware and was family-run. Owner Billy Shire expanded the store’s inventory over the years to include items that represent popular culture, counterculture, and Los Angeles art. The store is also home to the La Luz de Jesus Gallery, where art shows are held every month. This post wouldn’t be complete without a shout out to the skateboarders out there in Southern California. Kingswell is a rare store for professional skateboarders and those interested in beautiful design and street culture. Kingswell celebrates Los Angeles artwork, well-designed skateboards, and tattoo art. Skaters will find hats, shoes, t-shirts, and skateboards from brands like Converse, Huf Cromer, and Santa Cruz Skateboards. We hope this post has inspired your next shopping trip as you get to know the small businesses within Los Feliz. Real Estate Unlimited is a real estate agency with expertise in luxury real estate in Los Angeles. Whether you are looking to buy or sell a home in Los Feliz or in another Los Angeles neighborhood, we are here to answer your questions, share our knowledge with you, and help you find the right fit. Feel free to contact us today. The Los Feliz neighborhood is one of the most vibrant and culturally diverse in Los Angeles. As a result, residents are spoiled for choice when it comes to finding a place to eat. In this post, we’ll share some of our very favorite dining options in the area, so you’ve got a shortlist when you plan your next visit! Like most parts of Los Angeles, traditional and fusion Mexican-inspired cuisine makes a strong showing in Los Feliz. One standout venue is Yuca’s, whose original location opened here in Los Feliz just over thirty year ago. The owner won a James Beard Award for her superlative cookery, and the resulting media buzz allowed her to open a glossy second location on Hollywood. We prefer the original location, whose cozy, intimate interior is the perfect place to enjoy Mexican cuisine from Socorro Herrera’s kitchen. You can find a long list of traditional favorites on Yuca’s simple yet splendid menu, and we recommend Yuca’s burrito: satisfying comfort food in an unassuming package. If you’re planning a romantic evening, you can’t choose a better restaurant than Figaro Bistrot, a little slice of Paris in the heart of Los Feliz. Mirrored walls in gold lettering, spindly ironwork chairs, and elegant menus for the patrons: you’ll think you’re in Montmartre. The pastry case near the front entrance is filled with scrumptious creations of delicate pastry and rich cream, including eclairs, profiteroles, and a gleaming selection of fresh fruit tarts according to the season. If you’d like to sit outside and watch the people strolling by in traditional flaneur style, grab one of the wicker chairs out front and sample a noisette or a café au lait. If you’d like a more substantial lunch, try the onion soup covered with a toasty golden-brown layer of molten gruyere, or the veal entrecote with tangy green pepper sauce. Looking for a music and cocktail venue to round out your evening? Check out the Dresden in Los Feliz! Named for the Italian word for “hope,” this family-friendly restaurant concentrates on fresh, unpretentious Italian fare. Tender, homemade pasta and tasty homemade sauce makes up the bulk of the menu, and every single combination – especially the ones that come paired with succulent seafood – is worth trying. We like the carbonara and the creamy alfredo on a platter of linguine, but we can’t honestly say that any of Speranza’s pasta dishes are anything but sublime. Perfect for an extended-family visit or a quiet Sunday night meal – just bring a hearty appetite. O Banh Mi is one of Los Feliz’ best kept secrets – and one of its most precious. This little Vietnamese sandwich shop is hard to suss out, with the only signage being a neon O shining in the window. O Banh Mi is devoted to banh mi, the traditional Vietnamese sandwiches comprised of pate, honey, meat, cilantro, and crunchy cucumber and carrots on a fresh baguette. Opening hours are restricted from noon to 4 p.m., and residents in the know show up at noon on Friday, when a whole roasted pig is brought in to furnish the afternoon’s batch of sandwiches. If you’re interested in trying another variety of banh mi, you can choose from pork, chicken, or tofu. More adventurous snackers may want to try the pungent anchovies or salty squid version. Whatever you choose, you’re sure to enjoy an authentic Vietnamese treat. Just remember to get there by four – and don’t forget to bring cash. Okay, maybe it’s cheating for us to put an ice cream parlor on the list – but you won’t blame us for making an exception when you see what McConnell’s has to offer. This small chain of ice cream parlors originates in Santa Barbara. The Los Feliz branch opened just last year, and it’s safe to say that it’s a neighborhood hit. (Proximity to another Los Feliz crowd-pleaser, HomeState, definitely isn’t hurting McConnell’s chances of becoming a neighborhood fixture.) The parlor includes a rotating selection of seasonal flavors as well as several permanent options. We like the chocolate almond brittle and the cool peppermint stick. Fruit flavors tend to be seasonal, but they’re always fresh, inventive, and delicious. As the name implies, this restaurant is a great place to refuel – breakfast, lunch, and sandwich options are among the most unique – and delicious – in Los Angeles. Their coffee and espresso drink menu is inventive and consistently delicious – try the almond-macadamia latte for a sugary pick me up – but sandwiches and homemade baked goods are not to be missed. If you’re a blintz fan, try the L.A. Baby, a baked pancake served with crème fraiche and fruity preserves. If you’re in the mood for a savory breakfast option, try the toasted pan de sel breakfast sandwich with egg, bacon, onion jelly, and spicy arugula. The chicken salad sandwich on a baguette is our favorite for a fortifying lunch, but don’t be afraid to explore the daily and weekly specials, which are rotated frequently. Just don’t forget to grab a cookie for dessert! Planning a weekend trip to the neighborhood? Don’t forget the Greek Theatre in Los Feliz! Like so many of Los Angeles’ signature neighborhoods, Los Feliz is a vibrant mix of quirky charm, hip upscale hot spots, and old Hollywood glamour. In this post, we’ll give a list of the seven best restaurants in Los Feliz! Why not dinner and a show? Read our post about the Rockwell Table and Stage in Los Feliz! As the name insouciantly implies, Little Dom’s is the little brother of gone-but-not-forgotten Dominick’s in West Hollywood. Italian-influenced cuisine with an emphasis on satisfying plates like scrambled eggs bruschetta, meatball sandwiches on soft baguettes, and crisp golden whitefish picatta. If you’re in the mood for a sweet breakfast, the fluffy ricotta and blueberry pancakes are ridiculously delicious. If you’re looking for an affordable prix fixe spread that will leave you stuffed, the three-course Monday-night supper provides you with delicious home cooking at a bargain price. Don’t let the name fool you – the Alcove’s menu is by no means limited to scones and avocado toast. This cottage-like café serves up heaping plates of gourmet American dishes as well as a long list of lighter fare like salads, wraps, and paninis. If you are hoping to grab a cup of coffee and a bite of pastry, the plethora of baked goods in the pastry window includes raisin-studded scones, buttery croissants, soft danishes, and frosted cinnamon rolls. If your sweet tooth still isn’t satisfied, grab a house-made chocolate bar from the display by the register – flavors include but most definitely are not limited to red velvet, salted caramel, and orange-infused mimosa. If you stop in for an early dinner, the adjacent Big Bar is the perfect spot to stop for an eclectic lineup of cocktails, craft brews, and fine wines alongside an innovative selection of bar bites. As with most neighborhoods in this SoCal metropolis, you’ll be spoiled for choice if you’re looking for tacos or tortas in and around Los Feliz. If you’re on the hunt for Tex-Mex in particular, however, your options may be slightly more limited so many miles from El Paso. HomeState will cure your homesick yearning for Lone Star-style Mexican food, with an exhaustive menu that is especially heavy on the savory breakfast options: fluffy scrambled eggs, crispy bacon, melted cheese, refried charro beans, spicy chorizo, tender brisket, and more. Migas, chilaquiles, tamales – and if you really want to try an original fusion creation, check out their signature Frito Pie in a Bag, a crunchy bag of Fritos covered with chile con carne, black beans, lettuce, tomato, and Mexican-style giardinera. In the mood for a picnic in the sun? Check out our post about Griffith Park in Los Feliz! This unique café-market hybrid brings a whole new meaning to “farm to table” – Stamp Proper Foods is designed to serve as your one-stop shop for purchasing healthy ingredients and sampling healthy meals. Breakfast is on offer all day long, including savory Mexican-inspired fare like molé omelets, vegan chilaquiles, and piquant avocado toast. Sandwiches, soups, and salads are also served all day, with an emphasis on fresh, seasonal ingredients in inventive combinations. If you’re gluten-free, vegan, or vegetarian, Stamp Proper Foods is a very welcoming place – try the roasted sweet potato sandwich and or the zoodle salad with lemony vinaigrette dressing. Fill your basket with house-made granola bars, cookies, and other snacks. Traditional Italian fare makes a strong showing throughout Los Feliz, but we like Farfalla’s wholesome yet piquant menu. Portions are hearty, with an emphasis on familiar Italian favorites like chicken marsala, fluffy gnocchi, and homey pasta e fagioli. Crispy thin-crust Italian-style pizzas are also on offer, with toppings like juicy red onions and tender artichoke hearts. If you’re in the mood to split a bottle of authentic Italian vino rosso, Farfalla Trattoria boasts an exhaustive wine list, with flavorful selections starting at under ten dollars. MessHall is a dinette with a difference. Their theme is an original twist on summer camp food, with the mission statement to revive – and riff on – All-American comfort food favorites. Flavor profiles are simple without ever being bland or predictable. Their turkey kale chili is served with a thick slice of fresh golden cornbread, and their smoked corn fritters are garnished with a piquant poblano chili and pumpkin seen romesco. If you’re in the mood for more adult fare, MessHall also has a standout raw bar, including oysters with a variety of fresh dressings, tart ceviche, succulent shrimp cocktails, and delicate tuna tartare. Spitz is quickly becoming Los Feliz’s prime location for primo döner kebab. Spitz is part of a chain, and you can find sister locations in nearby Eagle Rock, Little Tokyo, and Studio City. Each location in the franchise offers customers a colorful, comfortable spot to dig into a hearty Meditteranean platter filled with creamy hummus, crunchy falafel, and savory braised meats. If you’re in the mood for a salty snack, try the Street Cart Fries, smothered in feta, green onion, tomato, olives, pepperoncinis, and garlic aioli. Los Feliz is a thriving neighborhood, and new eateries are hanging out their shingles on a weekly basis. Try these popular Los Feliz restaurants, and see if you find yourself a new local favorite. Are you a Broadway lover but you aren’t in New York City? Don’t fret, because the Rockwell Table & Stage in the neighborhood of Los Feliz in east Los Angeles features musical performances alongside meals crafted by Chef…If you haven’t been to the Rockwell yet, definitely check it out for a one-of-a-kind experience. Rockwell Table & Stage is a restaurant mixed with an entertainment venue for musical performances, DJs, comedians, special events, and more. The shows at the Rockwell celebrate Los Angeles’ history as a leader in entertainment and innovation. In addition to excellent dining and craft cocktails, people go to the Rockwell to see musical parodies of their favorite Hollywood movies and cult classics. The Return of The Unauthorized Musical Parody of Hocus Pocus this year celebrates the goofy Halloween movie, that you may remember watching every year, starring Bette Midler, Sarah Jessica Parker, and Kathy Najimy. Or take for example the Rockwell’s past product Cruel Intentions the Completely Unauthorized Musical Parody. Actresses Sarah Michelle Gellar, Reese Witherspoon, and Selma Blair (who starred in the 1990s film Cruel Intentions) all met at the Rockwell for a performance of the parody. Gellar also appeared there with the writer and director of the film, Roger Kumble, and actor Sean Patrick Thomas. The production Romeo & Juliet: Love is a Battlefield was another nostalgic drama performed at the Rockwell. This time the play featured Pat Benatar’s 1980s music about love. Similarly, Rockwell Drops the Mic: Madonna is another celebration of an iconic singer’s music. Other performs and film directors celebrated at the Rockwell include Baz Luhrmann, Martin Scorsese, Tarantino, John Hughes, and Jeff Goldblum. The Rockwell is about more than musicians though. The venue hosts DJs, special events, parties, and more. Audience members look on at the 360-degree stage while enjoying the amazing ambiance, atmosphere, and comforting food. Back in the 1940s, the site of the Rockwell was an Italian Pastry Shop (Sarno Pastry Shop). Today, Chef Wayne directs the kitchen as well as Crumble Catering. Lunch, brunch, dinner, happy hour — you name it — you can enjoy it at the Rockwell. Diners partake of filet mignon tacos, sesame seed crusted Atlantic salmon, crab cakes with saffron aioli and watermelon radish, espresso rub pork chop, grilled cheese with Havarti cheese, truffle butter, and tomato bisque, to mention a few of the items on the current menu. On the menu, you’ll also find an array of flatbreads, salads, and burgers. Don’t forget to try some of the craft cocktails designed and served at the Rockwell, like the Alhambra (grapefruit vodka, elderflower, and jalapeno soda) or the the Rejected Suitor (honey scotch, blackberries, mint, and cointreau). The bottomless mimosas at Brunch are another popular item. Enjoy the beautiful atmosphere, fun performances, and delicious dishes at the Rockwell. There’s nowhere else you’ll have the unique experience of rocking out to your favorite tunes while enjoying amazing, Californian cuisine. Los Feliz is a neighborhood in central Los Angeles, just south of the Santa Monica Mountains. Homeowners enjoy close proximity to downtown Los Angeles, Hollywood, and Silverlake in Los Feliz. Los Feliz — named after Jose Vincente Feliz — is known for its hilly landscape, celebrity homes, and shopping, dining, and nightlife. Real Estate Unlimited is a luxury real estate agency with a team of professionals that are excited to assist buyers and sellers in Los Feliz and the other surrounding neighborhoods in Los Angeles. Feel free to contact us with questions about Los Feliz, Eagle Rock, Mt. Washington, Highland Park, Elysian Park, Echo Park, and more. Need some time away from the city? Head over to Griffith Park in Los Feliz, a neighborhood in Los Angeles. Owned by the city, this recreational land is enjoyed by Californians who escape there to go swimming, play golf, picnic, rent bicycles, camp, ride horses, and hike the trails. Known as the “Central Park of Los Angeles,” Griffith Park is home to the Heritage Tree, the Autry National Center, the Los Angeles Zoo, the Travel Town Museum, and the Friendship Auditorium. Read on to learn more. Colonel Griffith J. Griffith, originally from Wales, traveled to America during the 19th century. With the wealth he accumulated through gold mines, he purchased land in Los Angeles known as Rancho Los Feliz that would become the Griffith Park. After purchasing the land, he started an ostrich farm. Later, Griffith donated the park to the city of Los Angeles for the purpose of serving as a city park that would provide “recreation and rest for the masses” (website). As time went on, the park continued to expand, including the addition of 100 acres named after Cahuenga Peak. Today, the park covers five-square miles (4,310 acres). When you visit Griffith Park, be sure to include all of the sites in your visit. Dogs are welcome on leashes and cyclists enjoy specific trails. Griffith Park is the perfect family destination for barbecues, birthday parties, cultural events, tennis, soccer, and baseball . Located at 4730 Crystal Springs Drive from 5 am to 10:30 pm. You may recognize Griffith Park as the background scenery in Hollywood productions. It has been used as a filming location for the music video “Gun and Horses” (by Ellie Goulding), Criminal Minds, The Closer, “If I Had You” music video (by Adam Lambert), Full House, and the feature films Birth of a Nation (directed by D.W. Griffith in 1915), Who Framed Roger Rabbit, Back to the Future and its sequel, and La La Land. About Los Feliz: Los Feliz is a historic neighborhood in Los Angeles and is bordered by the Santa Monica Mountains, the Hollywood Hills, the Hollywood Sign, Silver Lake, and Atwater Village. Los Feliz developed from a portion of what was previously the Rancho Los Feliz land grant. Eventually, the land grant became the neighborhoods of Los Feliz and Silver Lake. Today, 35,000 residents call Los Feliz home. Real Estate Unlimited is a real estate agency with a team of professionals dedicated to educating clients about the neighborhoods, businesses, schools, and shopping in Los Angeles. Whether you are buying or selling, feel free to contact us today about Los Feliz and/or other neighborhoods in Los Angeles. Where can you enjoy beautiful views, visit art exhibits featuring Los Angeles artists and creators, and view architecture by Frank Lloyd Wright? If you haven’t been there, you definitely need to take a day to check out the Barnsdall Art Park in Los Feliz (near the Vista Theatre in Los Feliz). The Barnsdall Art Park was the creation and home of Aline Barnsdall. Barnsdall was an experimental theatre director with wealth from the oil industry. In Chicago, she met the world-famous architect Frank Lloyd Wright. Once she experienced sunny Los Angeles, she decided to commission an experimental theater and arts community on Olive Hill. The community included the Barnsdall Residence (Hollyhock House) as well as two smaller buildings. Ultimately, Barnsdall decided to gift the park to the city. Located at 4800 Hollywood Blvd in East Hollywood, the park overlooks Hollywood from the top of Olive Hill and covers 36 acres of Southern California land. This Los Angeles Historic-Cultural Monument near Hollywood and Vermont is bordered by the Hollywood Hills, Thai Town, Little Armenia, and Griffith Park. Barnsdall Art Park is known for its educational art programs, dedication to exhibiting contemporary and multicultural artwork of Los Angeles, and its beautiful views of the Los Angeles landscape and cityscape. This theatre venue seats 299 and hosts the Independent Shakespeare Company, the Artwallah Dance, the Thai Festival, and the Silverlake Conservatory of Music. Visit the Barnsdall Gallery Theatre to see dance performance, films, lectures, and special events. It is also available to rent for events like wedding and photo locations. More than eight-thousand children (in both local and outreach programs) are exposed to art through the Junior Arts Center Gallery. Three-years-old to eighteen-years-old can enjoy art classes for both children and their parents at the center. At the Junior Arts Center Gallery, you have the unique opportunity to view the students’ exhibits, where the diverse artwork of children is displayed and celebrated. This National Historic Landmark, also known as the Aline Barnsdall Residence, has been restored and preserved over the years. At the Hollyhock House, you will find images of hollyhocks mixed into the decor and the architecture. If you love historic homes, do not miss the chance to tour the house. It was designed by Wright in 1919, and Wright’s son Lloyd and Wright’s assistant Rudolph Schindler. The home housed the meetings of the California Art Club when it was first donated to the city by Barnsdall. Wright’s work on the Hollyhock House features the Mayan Revival style, a central courtyard surrounded by roof terraces, art glass windows, an entertainment room, and a built-in moat that empties into a fountain. Wright also designed two smaller homes that are today used for artists in residency. Managed by the City of Los Angeles Department of Cultural Affairs, the Los Angeles Municipal Art Gallery features artwork from local and international artists. The gallery focuses on the cultural diversity of the city and the state. Every year, the space hosts the exhibit for the DCA’s City of Los Angeles Individual Artist Fellowships. The 10,000-square-foot large gallery displays nine exhibits every year to share the contemporary work in California. The gallery also includes space large enough for installations, performance art, and sculpture. Other medias shown at the Los Angeles Municipal Art Gallery include video, photography, electronic art, architecture, and paintings. The upcoming exhibition Condemned to Be Modern, curated by Clara Kim, features pieces that explore and inspire discussion about Modernist architecture in Latin America. You can check it out between September 10th and January 28th. To visit Barnsdall Art Park, you can get off on the Sunset and Vermont Metro Red Line stop. We hope you have a unique experience and learn something new about the landscape, architecture, and culture of Los Angeles. You have more than likely heard of Walt Disney and Disneyland in Southern California, but you may not know that he first drew Mickey Mouse in his uncle’s garage in Los Feliz. Los Feliz is a neighborhood in central Los Angeles and is the home of approximately 35,500 Californians. Disney isn’t the only celebrity to work and live in Los Feliz; it has also been home to Brad Pitt, Beck, Adam Levine, Geena Davis, Val Kilmer, Katherine Heigl, Spike Jonze, Jenji Kohan, James Cameron, and more beloved Hollywood celebrities. Los Feliz spans two-and-half acres, but it wasn’t always home to Hollywood’s artists and actors. It was originally a part of the Rancho Los Feliz Land Grant that was passed on to Corporal Jose Vicente Feliz. The grant eventually became what is known today as Los Feliz and Silver Lake. The adobe home built by Feliz’s family is still standing and available to visit in Griffith Park. Los Feliz is known for its excellent shopping, vintage shopping, dining, and nightlife. The neighborhood is bordered by Hollywood, Silver Lake, the Santa Monica Mountains, Griffith Park, and the Los Angeles River. To get a sense of the area, visit Los Feliz Hills, Laughlin Park, Los Feliz Estates, Los Feliz Knolls, Los Feliz Square, and Franklin Hills. If the Hollyhock House and the creations of Frank Lloyd Wright draw you to the area, then you have to stop by the Ennis House and the Sowden House. Other historic sites to visit in Los Feliz include the Feliz Adobe in Griffith Park, the Lovell health House by Richard Neutra, the Franklin Avenue Bridge (also known as the Shakespeare Bridge), and the first Walt Disney Animation Studio. Enjoy your time in Los Feliz! Real Estate Unlimited is a real estate agency that specializes in luxury real estate in Los Angeles and the surrounding areas of Southern California. We have been assisting clients with buying, selling, and researching homes since 1980. Contact us today, and our team will be happy to assist you with finding a home in Los Feliz. Los Feliz is a Los Angeles neighborhood that is home to Griffith Park, Griffith Observatory, and the modern architecture like the famous Ennis House. One of the community’s most loved landmarks is the Los Angeles Zoo. Before it opened, the Griffith Park Zoo (built in 1912) was open to the public. In 1963, the Greater Los Angeles Zoo Association (GLAZA), a nonprofit organization, was formed to fund the building of the new zoo. The Los Angeles Zoo opened in 1966, covers 133 acres, and houses 1,100 animals. The Los Angeles Zoo is located at 5333 Zoo Drive, Los Angeles, CA 90027 and is owned by the City of Los Angeles. It is open every day from 10 am until 5 pm. Note that the zoo stops selling tickets at 4 pm and starts putting the animals to sleep at 4 pm. Free parking is available to visitors. You may want to look into combo tickets that are also for the Aquarium of the Pacific and the Natural History Museum, into military discounts, and into group discounts. Since 2002, the zoo is also home to a Botanical Gardens that includes 7,400 plants. Wildlife conservation is practiced at the zoo, where California condors are taken care of as well as mountain tapirs. Animals are given medical care at the Gottlieb Animal Health and Conservation Center. In addition to the exhibits, you can view the Worlds of Birds Show, in which endangered birds perform acts at show times throughout the day. (Shows are not held on Tuesdays.) At the Neil Papiano Play Park, children can play on the climbing playground and families can enjoy picnics. At the Winnick Family Children’s Zoo, families can watch presentations and visit the Muriel’s Ranch, the petting zoo where kids can pet animals and brush them. If needed, you can rent a wheelchair at the zoo or a stroller (both single and double strollers are available). If you get hungry, there is plenty of food and dining at the zoo. Reggie’s Bistro, named after the North American alligator Reggie, serves a full menu, craft beer, and wine. You can also stop by the Zoo Grill, Sweet Treats, Cafe Pico (offering beer, aguas frescas, and Mexican food), Mahale Cafe, La Casita, and Gorilla Grill. The Churro Factory serves delicious churros filled with caramel, cream, or strawberry and sundaes, pretzels, and popcorn. There’s something for every taste. You can shop at the International Marketplace for books, stuffed animals, and gifts (including dinosaur items). If you need things on the go, like hats, sunscreen, and cameras, you can shop at the Safari Station. Los Feliz is a historic neighborhood in Los Angeles that is bordered by Hollywood and the Santa Monica Mountains. Los Feliz is made up of what originally was Rancho Los Feliz. It is known as the home of many celebrities and is the site of two original designs by Frank Lloyd Wright, including the Hollyhock Home and the Ennis House. If you get a chance to visit the Los Angeles Zoo, we hope you enjoy it! Are you interested in learning more about the Los Angeles Zoo and other landmarks in Los Feliz and the city of Los Angeles? At Real Estate Unlimited, our experienced team is on hand to supply insight and knowledge about homes and historic neighborhoods in Los Angeles. To schedule a tour of Los Feliz or another neighborhood of interest, contact us to schedule a tour. We are happy to share our love of Los Angeles with you. The Greek Theatre is an outdoor venue where professional concerts, high school graduations, and community events take place. Located in Los Feliz at 2700 North Vermont Ave, The Greek was designed by Samuel Tilden Norton and constructed in 1929. The idea for the theatre is credited to Griffith J. Griffith (1850-1919), an American mining industrialist (born in Wales). He purchased the Rancho Los Feliz Mexican land grant in the late 1800s. Griffith donated the land (approximately 3,000 acres) to the city of Los Angeles in 1896, which became Griffith Park, and he funded the building of The Greek Theatre and the Griffith Observatory. Griffith stipulated that the theatre should be crafted in the style of Greek theatres. Traditionally, Greek theatres were outdoor structures where tragedies and comedies were performed to honor the gods. The chorus narrated the action with musical accompaniment. Orchestras were also common in these theatres (an area in the middle of the theatre where the scenes were performed). The Greek in Los Feliz, located in Griffith Park, has almost six thousand seats. It was upgraded during the 50’s, it was used as barracks during the second world war, and it was renovated in 1995. SMG has been managing the theatre since 2015. It’s home to many concerts and the graduation site for John Marshall High School and Thomas Starr King Middle School. The venue was featured in the film Get Him to the Greek (2010), starring Jonah Hill and Russell Brand. The Greek has hosted artists like Bruce Springsteen, Frank Sinatra, Sir Elton John, Carlos Santana, and more. It’s also been the location of television shows and films. You can also enjoy food and libations at The Greek at the north and south concession stands, the Agora Coffee Bar, the Plaza Bar, and the Mercedes-Benz Star Lounge. Are you interested in learning more about The Greek Theatre and other landmarks in Los Feliz and the city of Los Angeles? At Real Estate Unlimited, our dedicated and experienced team is available to provide insights and knowledge about neighborhoods and homes in Los Angeles. Call us to schedule a tour of Los Feliz or another neighborhood you may be interested in learning more about. Call us today, and we would be happy to share our love of Los Angeles with you.